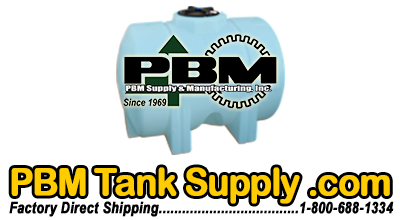 PBM Tank Supply's regular hours are between 8:00am and 5:00pm Monday through Friday. For any questions you can reach us by calling 1-800-688-1334 or from our contact page. Freight Customers must inspect all shipments before signing off on any delivery receipt. The customer is responsible for unloading all merchandise. All shipments are FOB shipping point unless otherwise agreed to in writing. PBM will determine the origin, method, and routing of shipment. All freight charges are the sole responsibility of the customer. By signing for your delivery you accept that your merchandise has arrived undamaged. Any visible damage must be noted on the Proof of Delivery before signing. If you have any questions regarding the condition of a tank please call PBM, while the driver is present, and before signing the receipt. PBM will gladly help you resolve any problems. PBM tanks leave our suppliers in good condition. Once they are turned over to the carrier, damage can occur. Scuffs and scrapes can happen in travel and do not void your warranty. If there is no notation of damage on the signed Proof of Delivery, the purchaser has accepted that the merchandise has arrived, been inspected, and is in good condition. PBM and/or the freight carrier will not accept responsibility for damage incurred to the merchandise if it is not noted by the receiver on the Proof of Delivery. Once signed for, you will accept all responsibility for the tank and can file a claim directly with the carrier for any damage. PBM will be glad to assist in this process. PBM cannot ensure that any shipment can be made by any specific time or date. Errors in shipping must be reported to PBM within 2 days of the time of receipt. - Transactions that you make with us. - - Applications and forms that you submit on our website. All information that we collect about you is restricted to employees that provide products or services to you. We maintain physical, electronic, and procedural safeguards to protect this information. Orders may be canceled at any time. All cancellations must be done in writing. Orders not canceled within twenty-four (24) hours of placement may incur a 10% restocking fee. Customers canceling orders after shipment are responsible for all freight charges incurred by PBM on their behalf. No returns will be accepted without prior approval by PBM. All returns must be accompanied by a copy of the original invoice. A minimum 10% restocking charge will be issued on all returnable merchandise. Return of special order items will not be accepted. Absolutely no returns will be made beyond 60 days from the date of invoice. Norwesco offers a three year warranty from date of manufacture on all premium weight tanks and a five year warranty on all heavy weight tanks. Should a defect appear within the warranty period Norwesco will supply a new equivalent tank in replacement thereof. Norwesco's liability is limited to the value of the tank itself and specifically excludes the cost of installation and/or removal or consequential damages. Please contact your chemical supplier or Norwesco Customer Service for chemical resistance information. Prices are subject to change without notice. All shipments will be billed at the prices effective at the time of order. Pricing errors will be corrected wherever found. PBM reserves the right to revoke any published offer and to correct any errors, inaccuracies or omissions at any time, including after an order has been submitted and a credit card charged.